The half-naked hero, Senkaji Chōō, of Suikoden fame, his body tattooed with a giant eagle draws his sword to protect himself from a clawed, orange maned monster emerging from a palm tree. An extremely rare Suikoden design by a talented Kuniyoshi pupil. Zhang Heng (Senkaji Chōō) is first mentioned in Chapter 37 of The Heroes of the Water Margin." We find out that he is known as Boat Flame. Zhang Heng's younger brother, Zhang Shun, is represented in the Lyon Collection by Yoshiharu's print at #1373. 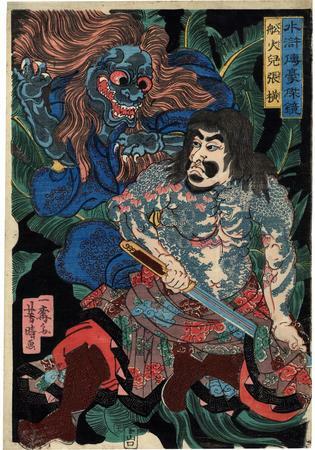 There is another print of Senkaji Chōō in the Lyon Collection (#904). It is by Kuniyoshi and also shows this hero with an elaborately tattooed body including a large bird of prey in a pine tree.